For the fifth consecutive year, MACC will present a two-day architecture conference. The 2018 conference theme is Scaling Disruptive Technologies – Moving from Innovation to Enterprise Transformation. Please come and join us for two days of concentrated learning and networking as the premiere architecture conference in the Midwest. 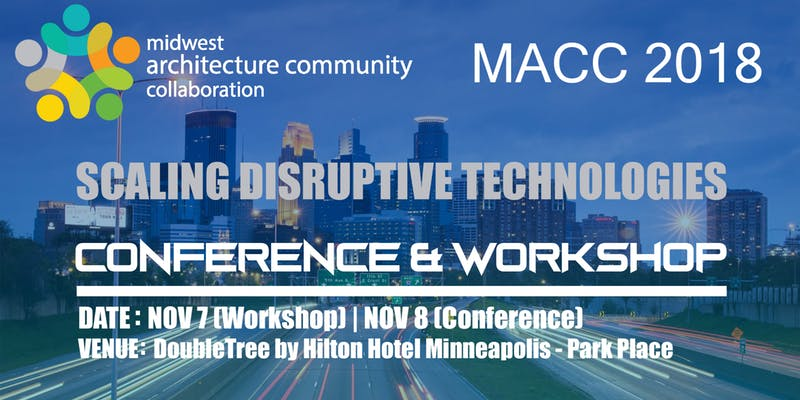 The Midwest Architecture Community Collaboration (MACC 2018) conference and workshop is the premier event in the Midwest for IT Leaders and Architects of all domains to learn and network on how to innovate and help transform originations with disruptive technologies. For the fifth consecutive year, MACC will present a two-day architecture conference. The 2018 conference theme is Scaling Disruptive Technologies – Moving from Innovation to Enterprise Transformation. People, process and technology will drive the effort to transform an organization from its current state to one that is flexible, agile and efficient. In support of the conference focus, MACC is pleased to announce this year’s keynote speakers. Dr. Tariq Samad, University of Minnesota Professor and Program Director of Graduate Studies in Management of Technology – Innovation cannot be neatly captured in a simple methodology or framework. Yet, innovation isn’t a random walk either. How can we effectively manage innovation in real world environments? Keith Narr, CTO Cargill – Driving Innovation and Agile transformation to support next generation data and analytics. Richard Walker, CEO York Solutions – Panel Discussion Leader – How innovation and disruptive technology are used to transform the enterprise. 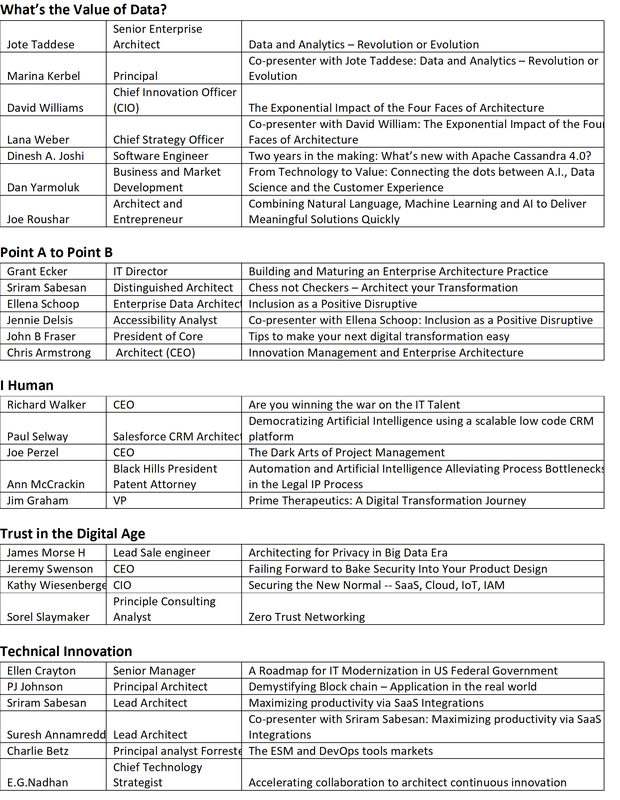 Please come and join us for two days of concentrated learning and networking as the premiere architecture conference in the Midwest. The workshop focuses on Innovation Strategy, in response to increased expectations of architects involved in the delivery of solutions to the enterprise. Participants will work through a collaborative architecture case study using a mix of presentation, group discussions, and exercises.